This web site shows the results of my work with two other metal workers, Ron Reil and Mike Porter. Our work has resulted in the design and creation of a very special family of high efficiency, hybrid, propane gas burners which you can explore on the products page. Although the description of these burners indicates a particular intended use for each burner, they can be used for any application which requires a high intensity burner of a given size and output. For BTU outputs of the more popular burners in the product family see the BTU charts page. Thank you. These burners are the result of many months of intense design and testing, in order to produce the maximum BTU output, temperature, efficiency, and economy, possible in a burner of this type. These are "naturally aspirated," jet ejector burners, meaning they do not require any external blowers or compressed air supply. They generate approximately a 28:1 induction ratio by volume, as compared with an 18:1 or 20:1 ratio for other burner types, such as the "Reil or EZ burners." They are self contained, which makes their use simple and clean, as compared to old fashioned inefficient plumbing systems where gas and compressed air are fed into a mixer tube, and the resultant gas mixture fed into a forge or furnace chamber where the burn takes place. This commonly used method has several drawbacks. First it is complicated to set up and operate, and needs an external power source. The operator has to adjust the gas flow and air input carefully to achieve the best possible mixture in order to achieve the slightly reducing atmosphere needed in the chamber. This is not very effective due to the presence of free oxygen in any "chamber burn" system. Also, the injection of cold gases into the forge chamber results in a decrease in the chamber temperature. A superior system utilizes a nozzle initiated burn, and completes the burn within a few inches of the mouth of the burner. This prevents the introduction of free oxygen into the forge or furnace, which can unite with the hot metal and cause scaling of the iron, or degradation of any metal in a liquid state. Free oxygen will also decrease the life of the chamber, and any crucibles or tooling exposed to it at high temperatures. The burners I offer here provide a "win-win" solution to these problems. Only completely burned gases are circulating around inside the forge or furnace chamber, resulting in less scaling of the iron, less degradation of equipment, and an increase in chamber temperatures. This also increases the fuel efficiency of the system, and results in better economy of operation, more bang for the buck, an important consideration considering the high fuel prices presently found in most locations. Another benefit of this burner design is the highly efficient choke system it utilizes. The burner is designed to operate at a slightly oxidizing mixture across its entire operating range. The choke is intended to allow instant and very easy adjustment of the flame to a neutral or reducing mixture as needed in your particular application. How do you know when you have the right gas/air setting you ask? You only have to look at the flame characteristics image on Ron's Forge and Burner Design Page to be able to instantly adjust your burner to its optimum setting. The color change from green to blue is the indicator that you use to judge your setting. The burners I offer are not made of off the shelf plumbing parts screwed together to produce a cheap, but less effective burner. The tuned burner intake chamber is turned and milled. Solid 1018 CR round stock is used for end cap; drilled & tapped for the gas jet. The jet alignment is axially true to the burner bore, and a long orifice jet is used to create an almost perfectly collimated, high velocity, gas injection stream, resulting in a tremendous Venturi suction being created. These are also "hybrid" burners. They employ the air intake and mixing chamber of a larger burner, and combine that with a small burner tube, resulting in a "super burner" of sorts. It will fit into a much smaller burner mounting, but provide the output of a much larger burner. Because of the tremendous Venturi vacuum that is created, these burners generate a significantly greater injection pressure. This allows the burner to be used as a carburetor to feed a supply manifold for multi nozzle injection, while having the actual burner remote to the forge or furnace. The increased injection pressure also makes this burner design less susceptible to "back-pressure" problems in the forge or furnace, which can result lower chamber temperatures, and the dangerous production of CO. 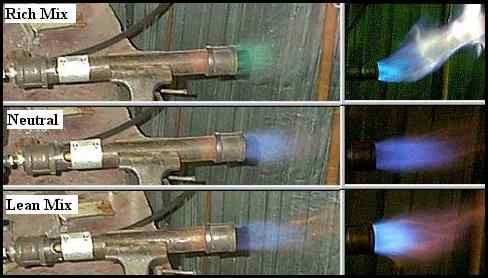 Although these burners will cost you more than building one out of off the shelf plumbing parts, you are getting a LOT more burner for your money. I am able to keep the prices of these burners relatively low through the use of jigs and mass production techniques. Each burner design is the result of thousands of dollars invested in building and testing many prototypes in order to refine the design to the absolute peak of efficiency and output. When you buy one of these burners you can be assured you are getting the highest quality and most efficient burner currently available today to the private shop or small business. Comparing Blown Burners and Venturi Burners -- Ron Reil shares his thoughts on forge design using venturi / naturally aspirated vs blown burners. If you have any questions about a particular burner, please e-mail me at Thank you. Nick finds 1"er to be like firing field artillery. The key to forging and foundry work today. Read a T-Rex user experience. This is a must see forge and Web site. If you are the kind of person who demands to own the world's finest forge to go with your T-Rex burners, also recognized as the world's finest, this is the forge for you. The three years of intensive R&D required to perfect this forge are evident in the fine looks, composite design, flux resistant liner, and even finer performance.